Pixel Dust Photo Art: Is your photo art ready to link up? Another week has flown by and I hope you are preparing a piece of photo art to showcase here for Photo Art Friday! I'm preparing the post today. Those of you who like to get an early start can link up your art beginning tomorrow, Thursday, the 22nd at 7:00 p.m. EST. If you are new to Photo Art Friday, you can learn more about it and review the guidelines by clicking on the button under my header, or by clicking HERE. Please remember to add a link back to the Photo Art Friday post in your own post. I have decided to shorten the number of days for Photo Art Friday from 4 to 3. So as of this week you will have Friday, Saturday and Sunday to link up (no more Mondays). Activity on the PAF post seems to wane off by Sunday. I would appreciate receiving your feedback about themes. Would a weekly theme help focus your artistic energies ... or inhibit them? So far I have not suggested any weekly themes but would love to get your input on the matter. One thing I do know is that if we do have themes they will not occur every week - but only occasionally. Since preferences will probably not be unanimous, at least that way everyone will feel their preferences have been taken into consideration. First, I need to hear your ideas. On another note, you may have noticed that I have opened a new little texture shoppe called Texture Singles. 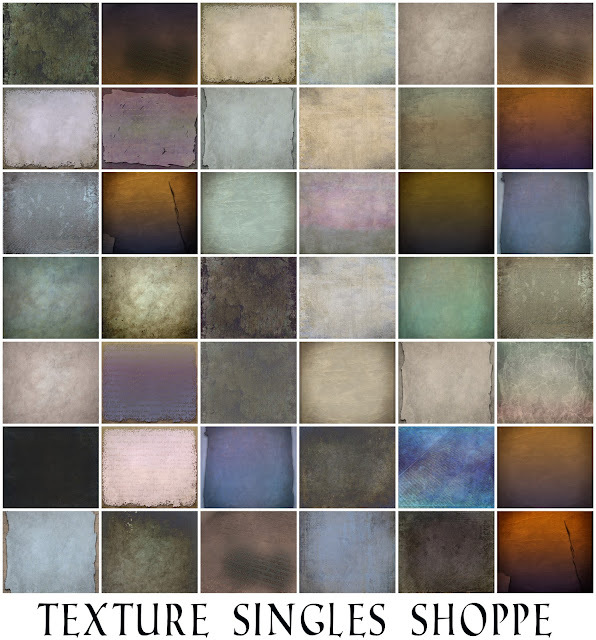 Instead of having to choose among sets or collections, at this shoppe you can purchase individual textures. If you spot one texture you would like to work with, you do not have to buy a whole set to get it! Or, if you want you can create your own little collection choosing exactly what you know suits your needs. Not to worry, free fine art textures will still be featured here every week, so you can still build an archive of textures that way too. I hope you will also take a peek at the new shoppe. Many of you have sent links to the digital enhancements you have made to your photographs with my textures, and I thank you! It's always gratifying to see how you are using the textures that I have created. There are so many great photo artists out there!!! Seeing your work makes all my work (and occasional frustrations!) worthwhile. Thank you too for spreading the word about Photo Art Friday on your blogs! Looking forward to seeing what you bring to the party on Friday!!! Bonnie - I'm really enjoying not having a theme or prompt. helena: Thanks so much for your feedback. Artists do tend to need/like a little elbow room. Someone else's ideas can feel constricting. That said - your two suggestions for when/if we do have a theme are really good. At the moment I enjoy the freedom of not having a theme to this new challenge, but I am sure it would not hurt to have an occasional theme to get the creative juice going into new directions. As Nancy says, you could make it optional. Have a wonderful day, and I'll see you here later. Hi Bonnie...I already have my photo art for tomorrow as well, just a few tweaks here and there. As far as "Themes" go, I also feel they should be optional. Since I'm really new to photography and trying to learn I'd prefer to not have "themes" but if you did them I'd rather they were occasional or optional as has been suggested already.